Ceremonialist, recording artist, healer and clown Alicia Merlady Bonnet offers music, gatherings, and New Moon Sister Circle information. Alicia's water color drawings and flying heart art pieces reflect her inner life. Alicia Bonnet and The New Moon Singers offer the New Moon Journey CD and Women's New Moon Guide to assist women who love to sing and gather for sisterhood in forming their own new moon sister circles. 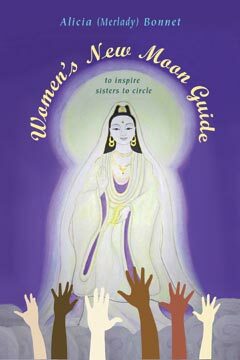 Buy a copy of the CD and book to start your own circle to connect with the other new moon sisters around the world. 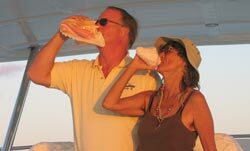 Captain Tom and Alicia blow queen conch shells at sundown in the Caribbean aboard Tom's boat. These ceremonial gatherings include Peace Fire, Sundown Conch Ceremony, New Moon Sister Circle, Whale Water Blessing, Celtic 13 Moon Ceremony. Private sessions include rites of passage events, weddings, boat blessings, memorials and individual healing sessions. Through them are interwoven elements of the Sufi, Goddess, Celtic, Clown, Christian and Native American traditions. 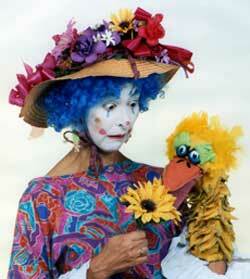 Alicia as Bubbles the Clown tells seasonal stories with puppets, music, juggling and clown antics. Have her come and play at your event. For more about Alicia's adventures, email her at aliciamerlady@gmail.com to receive her e-letter stories with notices of new music and ceremonies. See her blog to read on-the-road comments about her life and travels.